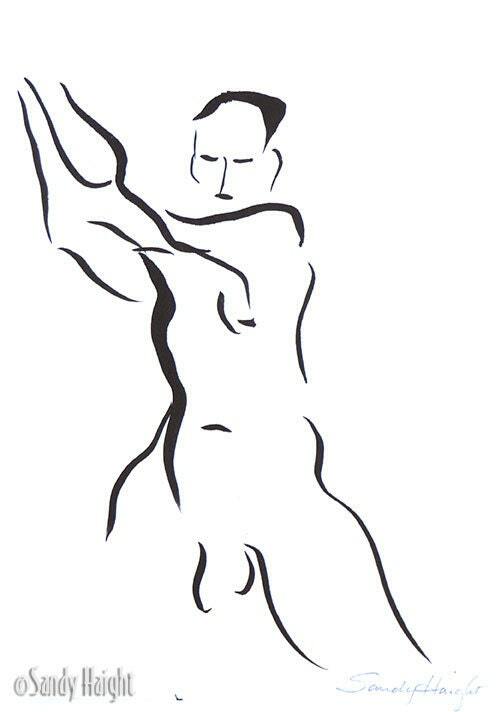 This man's active pose is captured with a few sumi brush strokes in a small, intimate, line art painting. This is an original sumi painting, not a print. Sumi ink painting on white rice paper mounted on masa to flatten the paper and bring out any subtle washes. Signed with my signature, delivered with foam core backing, wrapped in a protective sleeve ready to mat and frame to match your decor. A signed Certificate of Authenticity comes with the artwork. (The copyright notice is to protect this file and is not part of the original artwork). I’ve been doing figure drawing from live models since my fine arts studies at the University of Colorado. There I earned a BFA in painting and drawing. I took on the challenge of representing the humanity of the model while trying to render accurate and expressive proportions and began to understand why this exercise is a staple of art education and a basis of painting throughout art history. I try to keep in practice especially when my career as an illustrator is lacking in creative projects. (http://sandyhaight.com) During the shorter poses I use my sumi ink and materials and have found this to be my new challenge! I’ve been trying to find a way to reveal the figure with a few suggestive strokes to represent the pose and the vitality of the model. The shorter poses are always the most dynamic and expressive and lend themselves well to sumie.